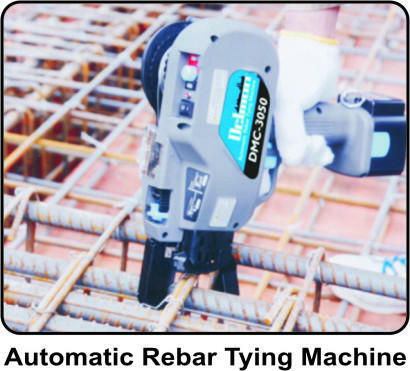 Delmon Automatic rebar tying machine, technological and practical, is a hand-held machine used to bind rebars quickly. It is an intelligent tool, with built-in micro-chips, can automatically finish all tying steps and widely used in construction areas, replacing the manual work of binding reinforced bars. • At present, there are three models available like DMC-0921, DMC-2040 & DMC-3050. These three models are designed specifically to meet different projects requirements. - DMC-0921 is to tie mesh or thinner re-bars from 09mm upto 21mm combination. - DMC-3050 is for bigger re-bars from 30mm upto 50mm combination. • Reduces risk of health problems: Simple operation of these tools reduces potential wrist damage such as carpal tunnel injuries. • It is about 5 times faster than manual tying. It make ties in approx one second per tie with consistent tie strength. High speed tying saves you time and money. Delmon Powertech Pvt. Ltd has consistently advocated the concept of "science and technology enterprise" and always follows the guideline of scientific and technology innovation. Insisting on "market-oriented, with scientific attitude, superb technology, solid workforce and new thinking, we commit ourselves to the research and development of new generation products. By constant technological innovation, we make our products feature from simple to complex, the use from single to wide, and blaze a path of high-tech innovation. We wholeheartedly welcome domestic and international customers and friends to visit and establish close relation. Our all staff of Delmon will forge ahead with determination and innovative spirit and make the greatest efforts for customer service. Since the establishment, we've always adhered to the principle of " brand extension market, honesty wins people's hearts. " Our products are widely used in construction sites, Bridge construction, Hydraulic Engineering, Road, Railway, Tunnel Construction, etc.